So, what do you think about gardening? Is it something you’ve ever done have you ever thought what managing your own garden would be like? Regardless of your answer, Lily’s Garden is a game that will give you the answers that you need as far as gardening is concerned. Remember, you should never be afraid to get your hands dirty. Your main job is to help Lily restore her garden to its original state. The garden belongs to Lily’s great aunt and she is working on it because she wants to rediscover her roots. Lily’s Garden will keep you busy in the most enjoyable way. If you thought that gardening is all that you will be doing when you play Lily’s Garden then you have another thing coming to. This story features much more than plain gardening. There are many twists and turns that you will encounter. There is actually a handful of characters Lily will interact with. They make the story much more interesting. Luke, is a character that Lily will take a romantic interest in. She will plant the ‘seeds of love’ in Luke’s garden and try to fight off her ex-boyfriend Blake at the same time. Talk of dramatic planting! There I’ll be more action that you can take as you play Lily’s Garden. You will uncover layers of the interesting story and still be required to uncover layers of the interesting story as you go. 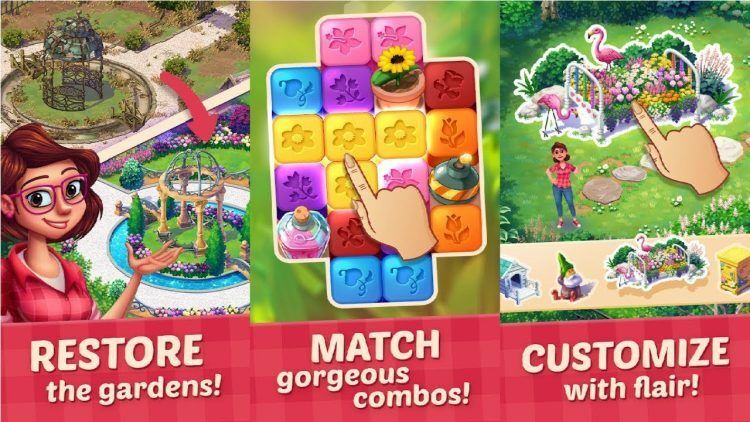 Apart from matching and collecting flowers in the garden, the games also have many unique puzzles to be completed. Every completed puzzle comes with lots of extra points and rewards that will propel you even further in the game. The garden is calling for you, get ready to till and plant. This will definitely earn you a few extra points that will come in handy while playing the game. It will outline a variety of tasks that should be completed on a daily basis and if you do so, then you will stand to gain many bonuses and rewards. This point goes hand in hand with the first one. When you log in every day, you will also earn additional points. It is not advisable to complete the daily tasks sporadically. It is better to keep the momentum going and do it each and every day. There are times when you will need to upgrade your gardening tools for the better. Do not fail to do so. Whenever you upgrade your tool, it will only perform better. The game may be called Lily’s garden but there are many other characters who are involved. All of them are linked to Lily in one way or another. Therefore, it is important to interact with them well and know the value that they add to the story. Go to the search box in Bluestacks and type “Lily’s Garden” without the quotes, of course. That is it! You can now enjoy your freshly installed copy of “Lily’s Garden” on your favorite PC!